Combining neo-classical and neo-Gothic elements, the church is beautiful building. It was built in 1862, then known as the Church of Nossa Senhora da Conceição; in 1910, it was made a cathedral. It is the most important Catholic building in the region. Its most talked about feature is the cathedral dome, which, while not that striking from the outside, is beautifully decorated with frescoes on the inside, with paintings of biblical figures. There has been some controversy regarding the need to restore the cathedral, as its looks and its structure are in danger of wearing down. It’s located in Aracaju’s historical centre, which means the square outside is quite historically significant too. 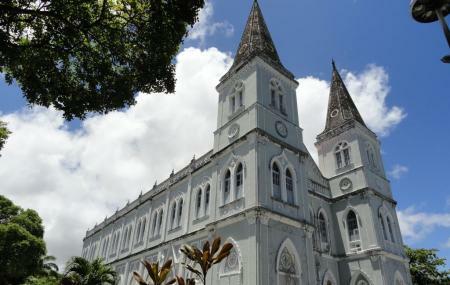 How popular is Catedral Metropolitana De Aracaju? People normally club together Centro Historico Aracaju and Santo Antonio Church And Hill while planning their visit to Catedral Metropolitana De Aracaju. Visitei, mas estava em reforma. Praça grande com muitas barracas de artesanato. Vale a pena visitar as vendedoras que comercializam produtos artesanais com preço acessível a qualquer pessoa. Aqui nada é tão caro. Diferente das lojinhas da orla. Sem contar que fomenta o comércio auxiliando pessoas com menor recurso financeiro. Pode visitar sem medo, pessoas muito educadas e comunicativas.